The view from the top of Imperial Ridge on Peak 8 in Breckenridge, Colorado is breathtaking, a 360 degree view all around of the magnificent Rocky Mountains that have created paradise for skiers from around the world. The top of Peak 8 sits at almost 13,000 feet with a vertical drop of 3,398 feet down to the base that at 9,600 feet. 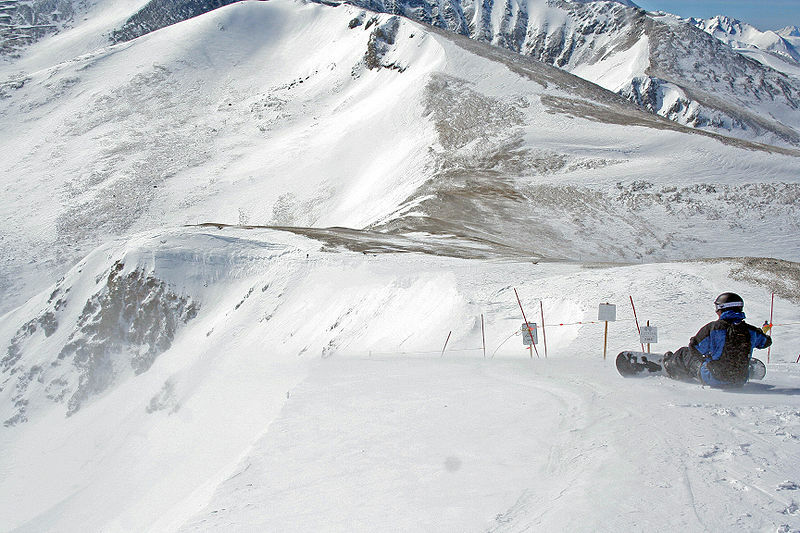 From the top, the Lake Chutes will deliver the daring skiers and boarders down to connect with one of the 155 runs available on the mountain, including 14% beginner, 31% intermediate, 19% advanced, 36% expert runs which can be accessed by the 30 lifts across the Breckenridge Mountain peaks. The skiers and boarders who are fortunate enough to be staying at Grand Lodge on Peak 7 in Breckenridge, Colorado simply add a perfect home away from home to their perfect ski paradise. Ranked in the top ten of all resorts in the Summit County area, which includes Vail and Aspen, Grand Lodge on Peak 7 just feels like home. The luxurious amenities, friendly staff, concierge, and ski shop just make it all a bit better than home. The ski in, ski out luxury condos at Grand Lodge on Peak 7 are completely furnished including well appointed kitchens with all of the necessities for snuggling in and whipping up hot meals on cold days. This entry was posted on January 30, 2013 by elevatemarketingaz. It was filed under Breckenridge Luxury Condo Sales, Breckenridge Real Estate, Breckenridge, CO Real Estate, Breckenridge, Colorado Real Estate, Fractional Ownership Real Estate, Fractional Ownership Real Estate Summit County Colorado, Fractional Real Estate Breckenridge, Fractional Real Estate Breckenridge Colorado, Luxury Fractional Real Estate, Luxury Fractional Real Estate Breckenridge CO, Luxury Fractional Real Estate Breckenridge Colorado, Luxury Fractional Real Estate Summit County, Co, Luxury Fractional Real Estate Summit County, Colorado, Summit County Co Real Estate, Summit County Colorado Luxury Condo Sales, Summit County Colorado Real Estate, Summit County Real Estate, Summit County, Co Luxury Condo Sales and was tagged with Breckenridge, Breckenridge Colorado, Breckenridge Colorado skiing, Breckenridge luxury condo sales, Grand Lodge on Peak 7, luxurious condos, ski out real estate breckenridge colorado, ski_in_ski_out Breckenridge condo, Summit County Real Estate.